Meat consumption likely to undergo shift as beef and pork prices are expected to decline. Over the past decade, U.S. beef consumption dropped 15%, while broiler consumption increased 5%. During the same period, pork consumption fell by 4%. According to Flavius Badau, economist with the U.S. Department of Agriculture's Economic Research Service, the key factor driving these trends is retail prices. For example, retail prices in May 2016 were around $1.90/lb. for broilers, $5.83/lb. for beef and $3.78/lb. for pork. Additionally, he said beef prices have risen much more sharply than broiler prices over the past 10 years. Between 2006 and 2016, beef prices rose 53%, mostly due to tight supplies, while broiler prices rose 12%. “Other factors that may have contributed to the shift away from beef and pork consumption include growing health concerns about red meat intake and increased availability of convenience chicken products, such as skinless, boneless breasts and ready-to-serve offerings,” he said. Meat consumption in the U.S. is likely to undergo a noticeable shift over the next decade, however, as production of beef and pork grows and prices decline, according to Badau. 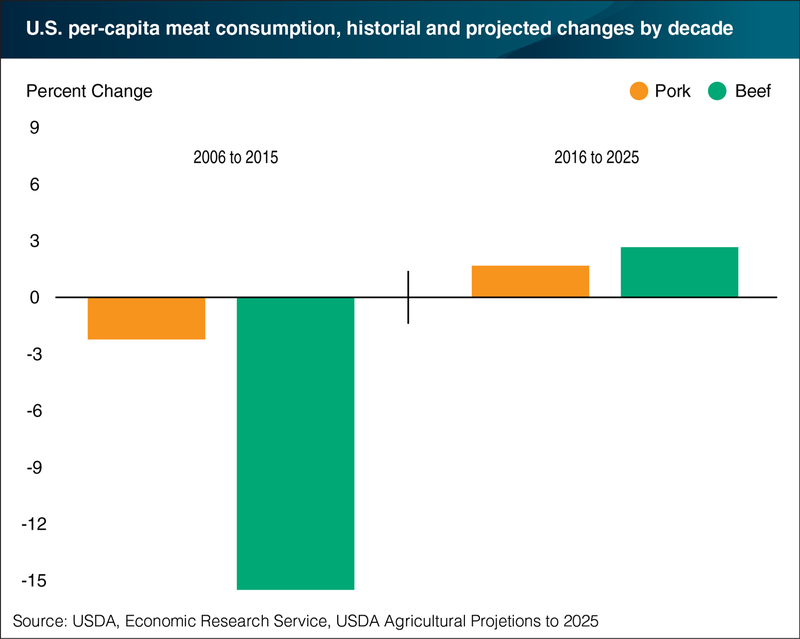 USDA baseline projections, which provide a long-run view of the U.S. farm sector, show that production of beef and pork will expand steadily between 2016 and 2025, driven by lower feed costs and strong meat demand domestically and abroad. Beef production and pork production are projected to grow by 11.7% and 10.3%, respectively, during the period. As a result of the anticipated expansion in production, beef and pork prices are projected to drop 10.6% and 11.6%, respectively, over the period, driving up demand for beef and pork and reversing a multiyear decline in meat consumption in the U.S. Per capita consumption of beef is forecasted to increase 2.7% by 2025, outpacing growth in consumption of broilers and pork, which are projected to rise 2.3% and 1.7%, respectively, during the same period. The rise in beef and pork consumption will increase the total amount of meat consumed per person in the U.S. from 211 lb. in 2015 to nearly 219 lb. by 2025.